Breakfast is often called the most important meal because it provides nutrition for the entire day. However, many people eat food rich in sugar and low in nutrition, so they end up feeling hungry and grumpy a few hours after eating breakfast. With a little extra planning, it’s possible to create a breakfast that satisfies a senior’s nutritional needs. Seniors who want to eat a healthy breakfast will likely enjoy these delicious options. Eggs are loaded with healthy proteins, so they can keep your senior loved one feeling satiated for hours. They also contain plenty of vitamin D, which is essential for absorbing calcium and preventing osteoporosis. 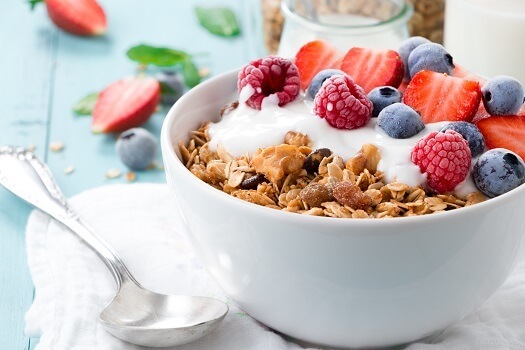 Pair them with some whole-grain bread to add fiber to the meal, and include a slice of tomato to make sure your loved one gets a little extra vitamin C and K.
Yogurt is an excellent source of probiotics that assist with digestion and keep the digestive tract regular. Pairing them with berries adds an extra dose of antioxidants, which fight off inflammation. The key to keeping this breakfast healthy is to use plain yogurt and sweeten it by hand. Presweetened yogurts tend to contain an excessive amount of added sugars. This liquid breakfast is great for busy seniors or those without teeth. The banana provides potassium, which balances water intake and reduces blood pressure. Peanut butter provides some healthy fats that can keep your loved one feeling satisfied until lunchtime. A hash of potatoes, peppers, onions, and tomatoes is both delicious and healthy. When cooked with their skins on, potatoes are an excellent source of potassium, vitamin C, vitamin B, and magnesium. The peppers in the mix contain even more vitamin C along with some antioxidants. This hearty breakfast is great for providing energy when your loved one has a full day ahead of him or her. Oatmeal is a quick and easy meal packed with health benefits. Oats have a lot of heart-healthy fiber, which slows digestion enough to reduce blood sugar spikes. Oats are very versatile. You can season them with cinnamon, fresh fruit, chopped nuts, or even cocoa powder. This quick and easy meal is a great way to add some healthy fats and fiber to your loved one’s diet. Avocados are an excellent source of monounsaturated fat that reduces heart disease risks. As long as you use whole-grain bread that’s low in sugar, the toast will be a healthy source of fiber. If you want to give your loved one a little extra protein, consider topping the toast with a fried egg. Eating a nutritious breakfast each day is just one way for seniors to enjoy good health. If you have a senior loved one who needs help maintaining a high quality of life while aging in place, reach out to Home Care Assistance, a leading provider of elderly care Oshkosh families can rely on. All of our caregivers are bonded, licensed, and insured, there are no hidden fees, and we never ask our clients to sign long-term contracts. If you’re looking for a comprehensive home care plan for your loved one, contact us at (920) 710-2273 today.